Bidders must register their details with gallery staff to receive a bidding number. Bids can then be made in person at the gallery by writing your bidding number and bid amount on the individual auction sheet for each work. Bidding will close at 5:45pm, Saturday 15th August 2009. All works have an undisclosed reserve price under which they will not be sold. If a works reserve is not met, the highest bidder will be contacted and offered the work at the reserve price. 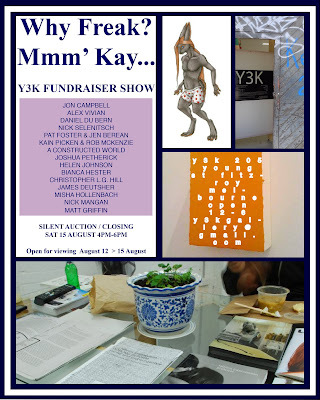 Y3K would like to acknowledge the mind-blowing generosity of all the artists involved in this show.